Raking in the middle of winter? Huh? If you thought that raking was only for gardens in summer, and leaves in fall, think again. Raking can be beneficial, even critical, in winter. The difference? You’ll be looking up, not down. Once significant snowfall hits – such as this past weekend – glance up at your roof. See all that accumulated snow? It looks innocuous enough. Probably is, for now. Things will change once direct sun or warmer temperatures emerge. Here’s the issue: When rooftop snow melts, the water flows down the roof and refreezes into ice dams. Ice builds up in gutters, and valleys and junctures of a roof. The frozen mass can push under shingles and flashing. The results show up as water stains (or worse) on interior ceilings and walls. The damage can be unsightly and expensive. How can you avoid these problems? The answer is to rake your roof. Yes, you read that correctly. 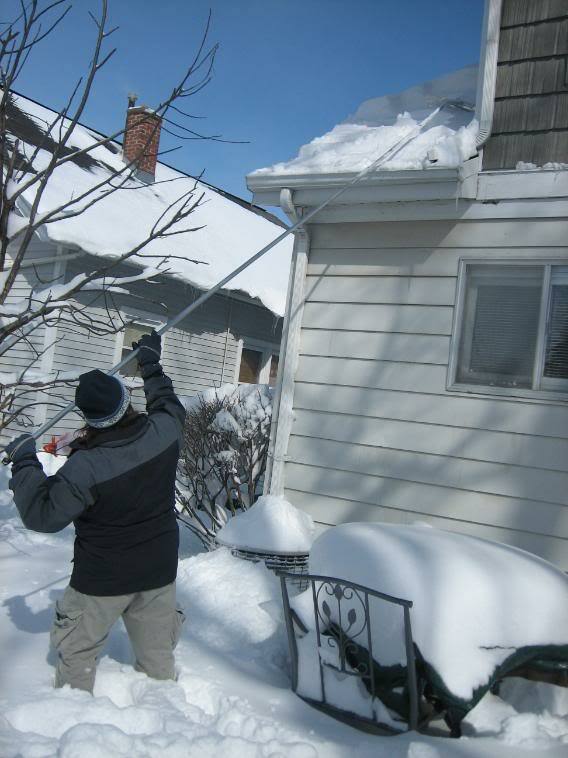 Clearing snow off, via roof raking, can vastly limit destructive ice dams in Brookfield, New Berlin and Elm Grove, WI. A roof rake is a metal pole, usually with optional extenders, and a scraper blade on the end. Using a downward motion, you literally pull snow off the roof. In some cases (using extender poles), you can clear nearly an entire roof. The process sounds easier than it is. Roof raking is physically taxing, especially on the arms and shoulders. The rake gets harder to move around as extensions are added. Still, the beauty of roof raking is that no ladder is needed, so it’s inherently safer than other snow-removal options. While the goal is to clear 4 to 8 feet of roof area, do the work in smaller “bites,” 2 to 3 feet at a time. Pull snow off the roof in a straight motion. Don’t scrape clear down to the shingles, which can harm the roof material. Clear off large middle roof spans. These typically have less support beneath, and can be stressed by the weight of snow. As snow falls from the roof, be sure it doesn’t cover ground-level heat vents, dryer vents or egress windows. Don’t let it crush window well covers, either. Avoid trying to break thick icicles with a roof rake. Its aluminum build – designed to be lightweight - can damage or even break. Stores are usually sold out of roof rakes by February. Given the relative paucity of snow this winter, though, some might be left. If you can’t find a roof rake, or would prefer not to do the work (trust us – it can be strenuous), GMS is glad to help. Call (262) 784-8219 and we’ll clear the snow off your roof. You can eliminate ice dam fears before they begin. A snowstorm like the one we just experienced is often the start of ice dams. Prevention starts with getting rid of the source, i.e. snow. Sure, “roof raking” might sound funny. Taking care of your home and yard, though, knows no season.